Vitiligo is a skin condition that causes patches of pale white skin. Over time the light patches of skin may increase in size and/or spread to other areas of the body. It is caused by a loss of the skin pigment melanin in those specific areas. Around 1% of the population are affected, so it is fairly common. But it is NOT in any way infectious. You cannot get it from anyone else, or infect anyone if you have it. It’s important to note that vitiligo is more than just a ‘cosmetic problem’ though – it is a medical condition. Vitiligo Symptoms – What Does It Look Like? The actual symptoms of vitiligo are patches of skin that are paler than usual. These paler patches eventually turn completely white. The patches may initially be white in the middle and then surrounded by paler skin. The paler area will then usually also turn white over time. The surrounding edges of the affected areas can be very irregular or they can also be smooth even lines. Vitiligo can affect any area of the body, but most commonly affects the face, neck, hands and areas where the skin creases such as the joints. So it is most commonly seen around the mouth and eyes, fingers and wrists, armpits, groin and genital areas. But it can also affect the mucous membranes causing white patches inside the mouth and nose too. In some people it will also affect hair roots – which can result in premature grey or white hair on the head. But can also affect eyebrows and eye lashes too, turning them white. Some of those affected do experience itchiness around the edges of the white areas. But otherwise vitiligo is not painful, doesn’t cause skin dryness and does not itself have any significant impact on your health. The progression of the condition varies a lot. Some will only ever experience a few very small patches here and there. While for others it progresses and the smaller areas may eventually join together, and cover much larger areas of the body. There is no way to know in advance how vitiligo will progress. Where the whole body is affected this is known as universal vitiligo. This is extremely rare, but this has now been confirmed to be the condition Michael Jackson suffered. There are two main vitiligo types, known as non-segmental and segmental. Non-segmental or bilateral/generalised vitiligo is by far the most common type. It affects around 90% of sufferers. The light skin patches in non-segmental cases are often very symmetrical. That is, you get very similar looking patches on both hands for example. This type of vitiligo progresses more slowly. Segmental or unilateral/localised vitiligo affects only one area of the body (or ‘segment’, hence the name). So it will typically appear just on the face, or on one leg or arm. It is the much rarer type overall – only affecting 10% of people with vitiligo. It is however more common amongst children who have been affected (about 30% of children have this type). The immediate cause of vitiligo is a lack of melanin (or skin pigment) in the affected area. This is why vitiligo is a type of hypopigmentation (the word ‘hypo’ meaning small, and in this case referring to a lack of pigment). Without pigment to color the skin, it turns white. We do know that this lack of melanin is due to a dramatic reduction in melanocytes – which are the cells responsible for producing the pigment melanin. But what causes vitiligo is still not really known. 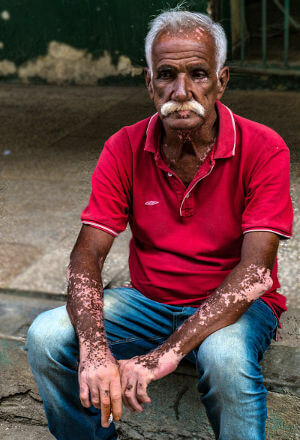 Non-segmental vitiligo MAY be an autoimmune disease. That is, the bodies immune system gets confused and starts attacking good cells (i.e. the melanocytes). There is also an association with hyperthyroidism (overactive thyroid gland), which is known to be an autoimmune disorder. But not all vitiligo sufferers have or develop thyroid problems. Hence why it may (or may not) be related! Most people who have vitiligo do not suffer from any other autoimmune problem. The causes of segmental vitiligo are also not really understood. It is known to be quite ‘different’ however, and may be linked to chemicals released by nerve cells in the skin that poison the melanocytes. Research into the causes of both is still ongoing. These have not been reliably proven as yet. You can read more about what causes hypopigmentation in general. Anyone can be affected, and indeed vitiligo does affect around 1% of the population (studies show between 0.5% and 2% ). People of all skin colors are affected. Although of course the darker your skin normally is the more noticeable the symptoms are. Men and women are also equally affected. About 50% of people who get vitiligo will develop it before they are 20 years old . And the overall majority before they are 40 years old. It is also not a new affliction. There are references to conditions believed to be what we now call vitiligo dating as far back as 1200-1500 BC. With the name vitiligo first being used in a 1st century medical book called ‘De Medicina’ in 47 AD. But there is no known way to prevent getting it. You either will or you won’t! There is currently no cure for vitiligo. But there are ways of treating hypopigmentation you can use to improve the appearance of the white patches themselves. If the areas are very small and/or you are very fair skinned, you may not wish to do anything to treat it at this stage. But for smaller areas it is fairly easy to use a simple cover up makeup. Just find one that matches your normal skin tone fairly closely. The downside is of course that you will need to keep reapplying the cover up. There are however ‘skin camouflage creams’ designed specially for this purpose (Keromask are very good, BUT get a sampler kit first to figure out your colors). They are water proof and can last up to 3 or 4 days without reapplying depending on the area of the body! You may also wish to consider creams that lighten the skin (you can get natural skin lightening creams which only use natural ingredients and avoid harsh chemicals). I know this approach sounds strange! But the idea is to use the cream to lighten the skin around the white patch. This helps to blend the patch in more so it doesn’t stand out quite so much. It can be very effective. It is much more effective with lighter skin tones though. Can Ginkgo Biloba Help With Vitiligo? Maybe! Another natural treatment that may be worth trying is ‘ginkgo biloba’. This herbal supplement has been studied in a clinical trial . The results did suggest that it could help stop vitiligo from getting worse, and even help restore some lost skin color! This was only for non-segmental vitiligo though (the most common type). It was also only a small trial, but did conclude that “Ginkgo biloba was associated with a significant improvement”. So they recommended a larger trial be carried out. If you want to give this a go, then it’s an easy option with no known side effects. And ginkgo biloba supplements are very cheap (on Amazon here). The clinical trial used one 60mg capsule taken twice a day. If you’re taking any medications already though let your GP know (if you want to try any herbal supplements), just in case they may interact with the drugs. For larger areas or more progressed cases your doctor may well refer you on to a skin specialist or dermatologist. A common approach from here is to use steroid creams. They may slow down the growth of lighter patches and may help to return some color too. But the results are a bit unpredictable, and there are side effects to be concerned about when using topical corticosteroids. The creams typically have to be applied every day, and your doctor will follow up to assess progress or any side effects. If you experience side effects such as thinning of the skin or dermatitis then treatment may have to be stopped. Results can range from minor improvements where you continue treatment of vitiligo (with breaks), through to significant improvements where you may even be able to stop treatment. There are also now alternatives to steroids called ‘calcineurin inhibitors’. These haven’t been formally studied for use with vitiligo, as they are typically used to treat eczema sufferers. But they have been used successfully. They do still have side effects, but don’t cause thinning of the skin. Phototherapy is another option that may be used. But it’s typically only used in more serious cases or where creams have not worked. This is mainly because it is time intensive and therefore an expensive treatment to provide. The treatment involves carefully controlled use of UV (or ultraviolet) lamps. This may also be combined with a drug called psoralen which is designed to make your skin more sensitive to UV light. This is referred to as PUVA therapy (i.e. PUVA = P for psoralen, and UVA for UV Type A). Sometimes UVB light is used instead as this has a lower skin cancer risk. The results can be quite effective but are a bit unpredictable and will not completely reverse the loss of pigment. Yes, it is possible to get UV lamps you can use at home. But you can’t just buy any old lamp, as you can put yourself at significant skin cancer risk. Sometimes home UV treatment is possible, but only under the guidance of a specialist. Of course none of these treatments can guarantee to stop the condition from spreading, but they can help to manage the condition. Other more serious treatment options include skin grafting – where a patch of skin is taken from an unaffected area of the body and placed over the white affected area. This is typically only ever considered where the condition hasn’t got any worse in over a year. That is, no new patches have appeared and existing patches haven’t grown in size. It’s also not used where the vitiligo is as a result of skin damage – for obvious reasons! There has also been some success with transplanting melanocytes from healthy skin into the areas affected by vitiligo. Although this option is expensive and not widely available. It’s best to get your doctor/GP to make a formal diagnosis if you think you may have vitiligo. They will ask questions about things like your family history or whether you recall injuring or getting a bad sun burn in the area affected. And if the area has changed at all since you noticed it – has it got bigger or smaller, or changed in color. Your GP may also look at your skin using a UV lamp. This helps to make the patches much clearer to see, and help greatly in making an accurate diagnosis. Vitiligo can sometimes look a bit like other conditions such as pityriasis versicolor, which also causes pigment loss but is a very different thing as the root cause of that is fungal. Your doctor may also requure a blood test – this is to check on how well your thyroid gland is working, as some vitiligo sufferers also suffer hyperthyroidism. It is also important to remember that melanin, the skin pigment, is what provides our skins natural sun protection. So the white patches where melanin is lacking will be much more sensitive to the sun than normal. You will need to take extra care in the sun, and protect these areas with sunscreen even more than you normally would. Obviously using sunbeds, UV based tanning salons or sun bathing is best avoided completely. The side benefit of not tanning will of course mean your skin is generally lighter all over, which makes vitiligo patches less noticeable anyway. Spray or fake tans are probably still OK, although caution would be wise and testing on a small area of affected skin first may prove prudent. Do however bear in mind that some limited sun exposure on your skin is important. This both triggers vitamin D production in your body, and helps to improve your mood and psychological health. You may wish to consider taking a good general multivitamin to ensure you still get enough vitamin D – the recommended daily amount is 10mcg (micrograms). Also be aware that vitiligo can sometimes cause problems with your eyes and ears. So if you experience any eye discomfort or concerns with any decline in your hearing it is worth mentioning this to your doctor. Vitiligo is treated differently within different cultures around the world. In India for example it is still often referred to as ‘white leprosy’ – when it doesn’t of course have anything to do with leprosy. Some countries simply accept it as perfectly normal and common. Due to the fact vitiligo affects your appearance, and sometimes quite dramatically, there can be significant psychological side effects as a result. Particularly if there are significant white patches in very visible areas such as on your face, or if it leads to a loss of hair color. This can lead to degrees of self-consciousness and a loss of confidence. Please do mention this to your doctor, as they will be able to refer you for help in coping with this. Do also remember that this is a very common condition affecting around 1 in a 100 people. So you are most definitely not alone. There are many support groups and organisations that can help greatly in this area, such as vitiligosupport.org and avrf.org.